Easy to tune and equally as easy on the eyes if you like a little bling in your drums. Superb, eye-catching finish. Quality build. Particularly suited to mid and low tunings. Could do with a medium setting on the strainer. 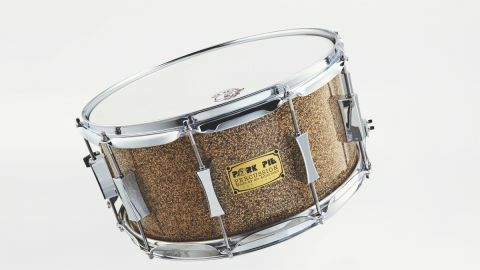 The rather unique Bettis B20 snare is the to be added to the latest model Californian custom drum builder's USA line which is manufactured in the Pork Pie workshop. The Bettis B20 is named after custom cymbal maker Matt Bettis, and this is the first drum we've encountered to be finished with real pieces of cymbal alloy. Founder and president Bill Detamore explains how the off-cuts left from the cymbal lathing process are collected, crushed and then formed into sheets ready for drum wrapping. He also adds that: "Interestingly, Matt gets his cymbal blanks from Sabian, so the material is actually Sabian B20 Bronze." The shell itself is in fact a relatively run-of-themill 8-ply maple, completed with 10 signature hourglass lugs, 2.3mm tripleflanged hoops, 20-strand brass snare wires and Pork Pie's own signature strainer. Sizes are limited to 14"x7" (as review) and 13"x7". At first glance, this sure is an impressive finish. The cymbal glitter wrap is indeed striking, although admittedly not dissimilar to a typical gold sparkle-style wrap that can be found on many a Tama Starclassic and DW Collectors kit. Upon closer inspection though, it is clear to see the detail in each golden fragment that are, unmistakably, tiny pieces of beautifully shiny cymbal alloy. These appear to be set against a black background which re-appears in small specks around the drum shell. Also noteworthy is of course the depth of the drum, measuring in at a sizeable seven inches. This gives the snare the ability to handle lower tunings incredibly competently, yet keep a well-rounded tone into medium and high tunings. In addition to this, the 20-strand brass snare wires work absolute wonders in assuring that a weighty backbeat is created with every strike of the drum, regardless of pitch. Coupled with the Pork Pie strainer, quick changes are not only easy to achieve but also instantly noticeable within a mix. It would be great, though, to see a medium setting on the strainer for speedier adjustability. Specifically, this drum sounded utterly fantastic tuned down with plenty of dampening for that fat-back sound.